The stand mixer makes quick(er) work of brioche. I use some sourdough starter for flavor, as well wholegrain flours. This recipe is dedicated to Jeremy F., who has requested it. Adapted from Serious Eats, which includes a link to a slideshow that has helpful images on the techniques used. Because flours differ from brand to brand, their amounts as well as the milk (or water) needed might vary. This makes enough for 2 medium (9-inch by 5-inch by 4-inch pans) loaves.. You can freeze the dough after the first rising, for baking later. Roughly hand mix all but the butter and egg wash. Then with stand mixer with dough hook, knead until smooth on low (level 2 on my 6-quart Kitchenaid mixer), about 2 to 4 minutes. The dough should be sticky, but if it’s too goopy (wet), I add more flour at this time. N.B. It’s easier to add flour to a wet dough than to add liquid to a dry dough, at this point; if you need to do the latter, add a little bit of liquid at a slow speed, otherwise it’ll splash. Slowly incorporate butter, one piece at a time. There should be no streaks of butter at all, nor any greasiness on the dough’s surface before you add the next piece of butter. This takes about 15 to 25 minutes at level 2, again depending on your mixer. Knead until stretchy, i.e., windows of dough when stretched; for me this was using level 3 for 6 to 10 minutes. 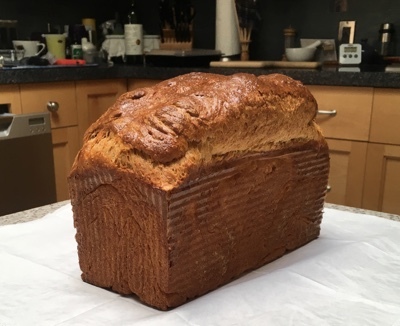 Allow to rise until almost doubled — it took me 1 to 1 1/2 hours when proofing in the oven (90º to 100ºF degrees) in a covered bowl (I just used the mixer bowl). Stir down the dough. At this point it can be divided and stored frozen. Preheat oven to 375ºF. As the oven heats up, brush the top of the loaf with the whisked egg. Place pan in oven, lower the temp to 350ºF, and bake for 20 minutes. Rotate the pan, lower temp again to 325ºF, and finish baking until the internal temp of bread is 205º to 210ºF, an additional 20 to 30 minutes. Cool in pan for about 5 minutes before removing loaf to further cool on a wire rack. Let cool for at least another 30 minutes before cutting and consuming. This was written by sairuh. Posted on Friday, August 31, 2018, at 12:38 pm. Filed under Food. Tagged bread, French, recipe. Bookmark the permalink. Follow comments here with the RSS feed. Post a comment or leave a trackback.